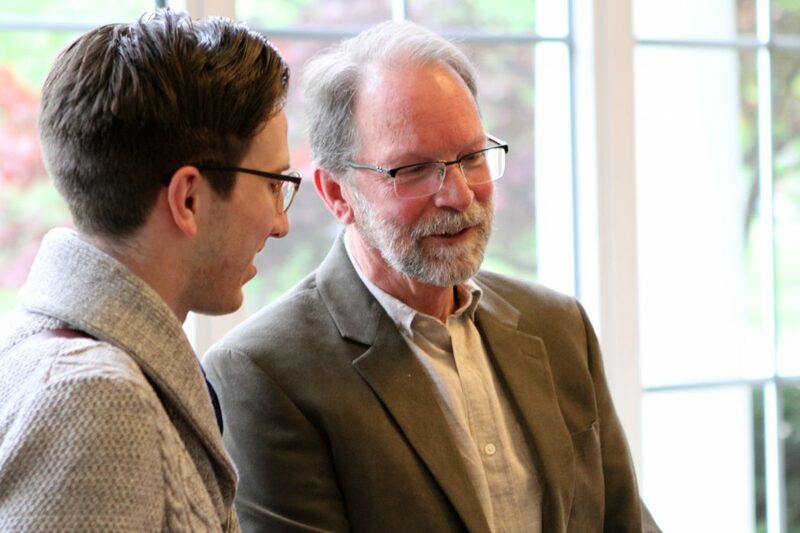 Professor of Theater Dwight Watson talks with Professor Michael Abbott ’83 at Watson's retirement reception. Mike Abbott says of Dwight: “He is the finest man, the best man I’ve ever known. The kind of man I’ve always wanted to be." 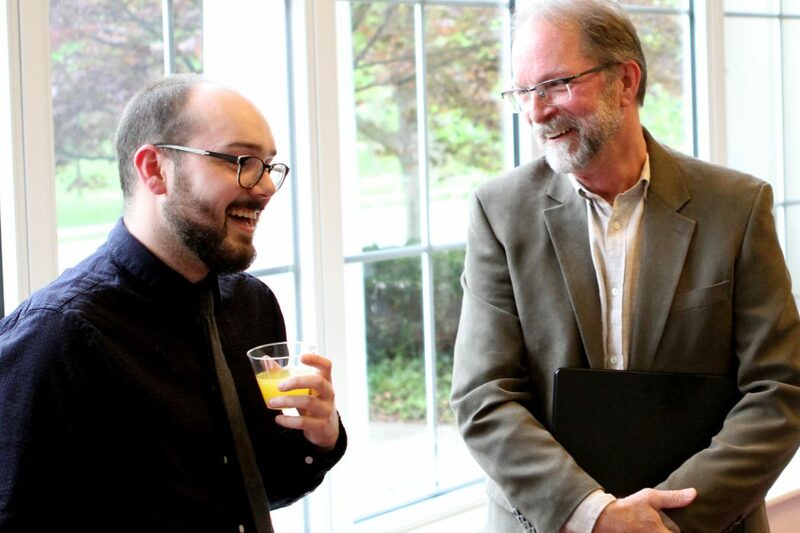 Discussing the lighter moments of "Whitehawk," the students' presentation at Professor Watson's reception. 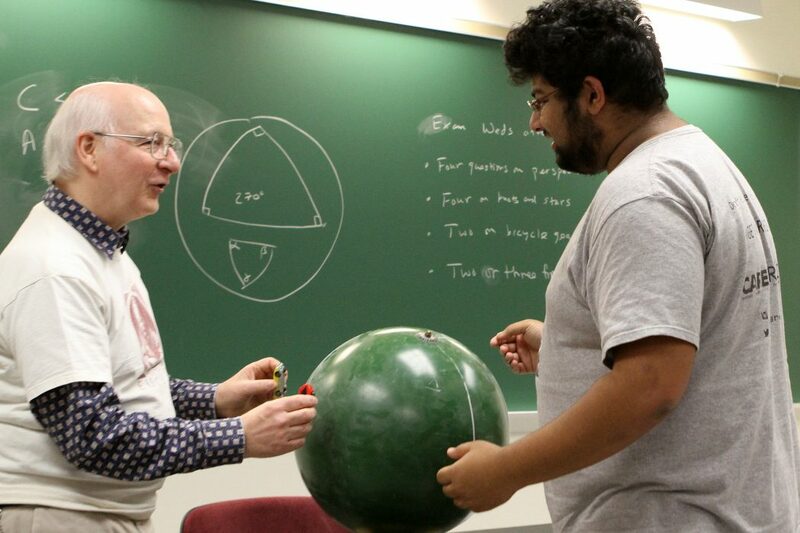 Professor Bob Foote and Richie Abedin ’17 discuss a theory of spherical geometry. 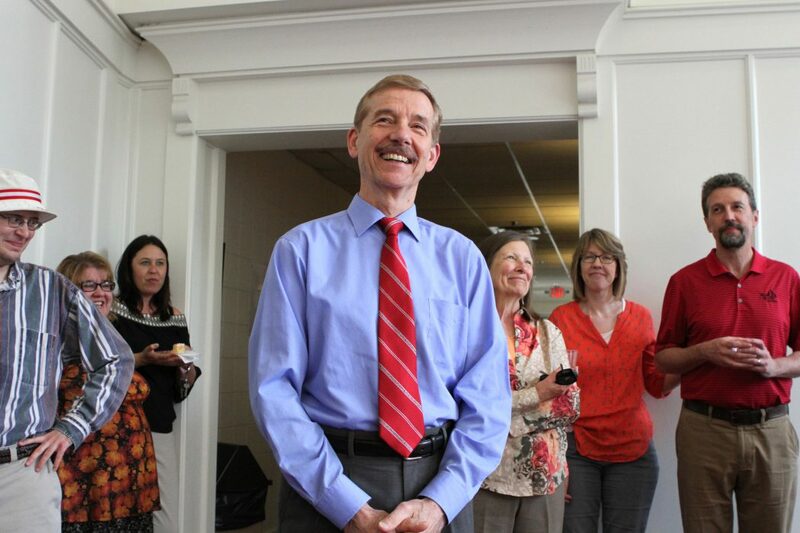 Professor Foote is surprised to see so many turn out to honor him on his last day teaching. 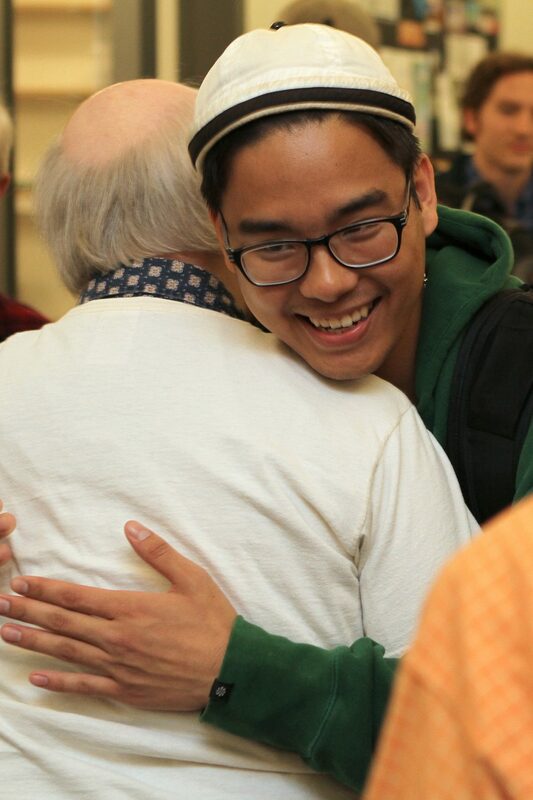 Tu Nguyen ’17 congratulates his teacher. Students and colleagues applaud Professor Foote. 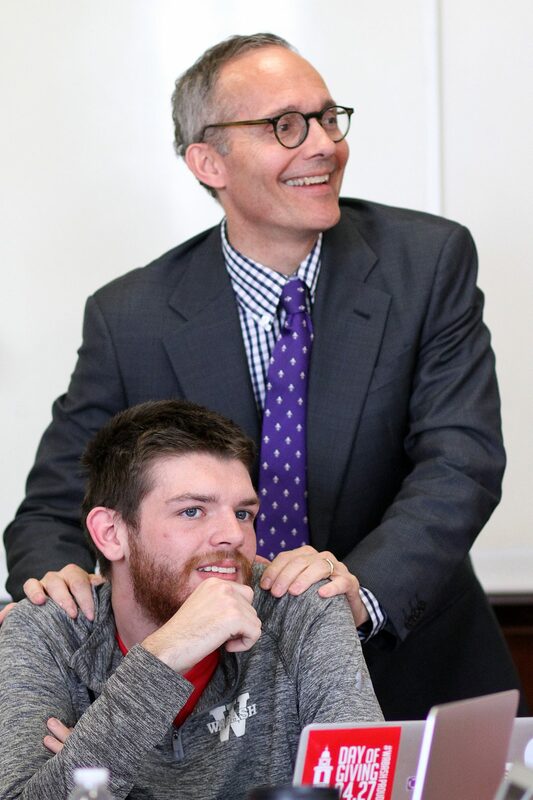 Glee Club Director and music Professor Richard Bowen was celebrated for his work with students, faculty, and alumni. Professor David Blix ’70 thanks Richard for his friendship. 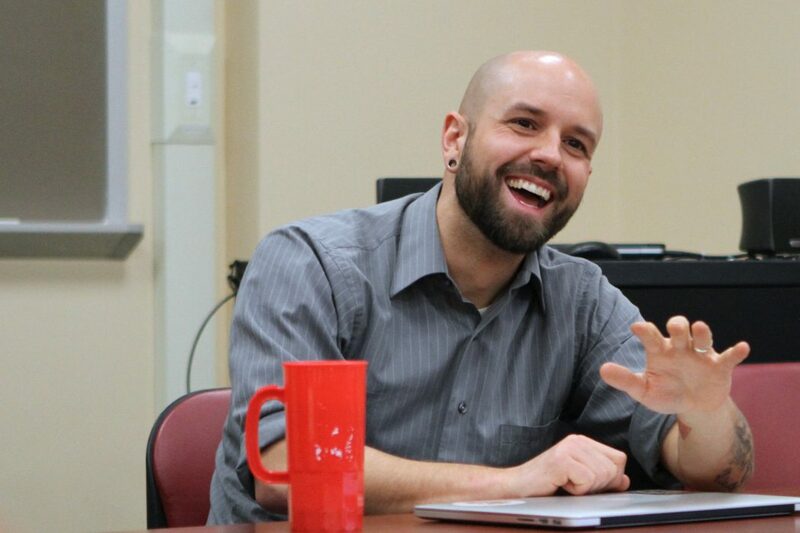 Professor Dan Rogers talks about his travels with the Glee Club in Ecuador. Glee Club members sing to their director. 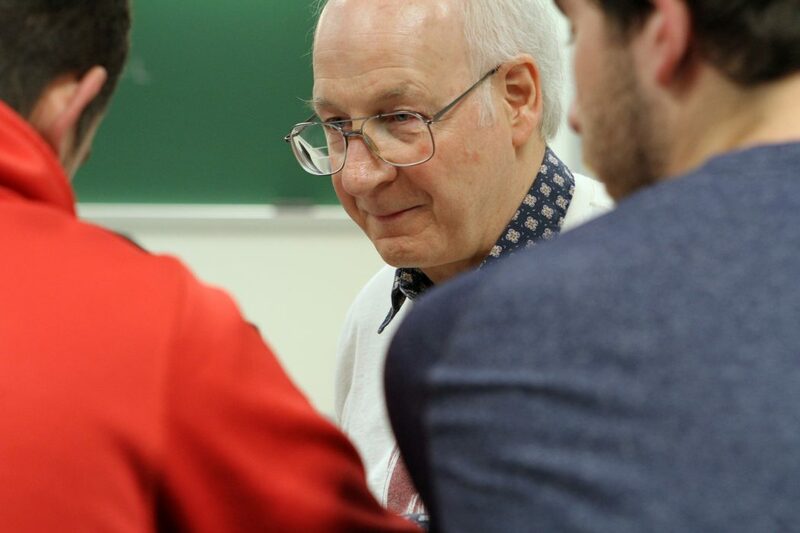 Professor Bowen talks with Professor Emeritus of Biology David Polley. 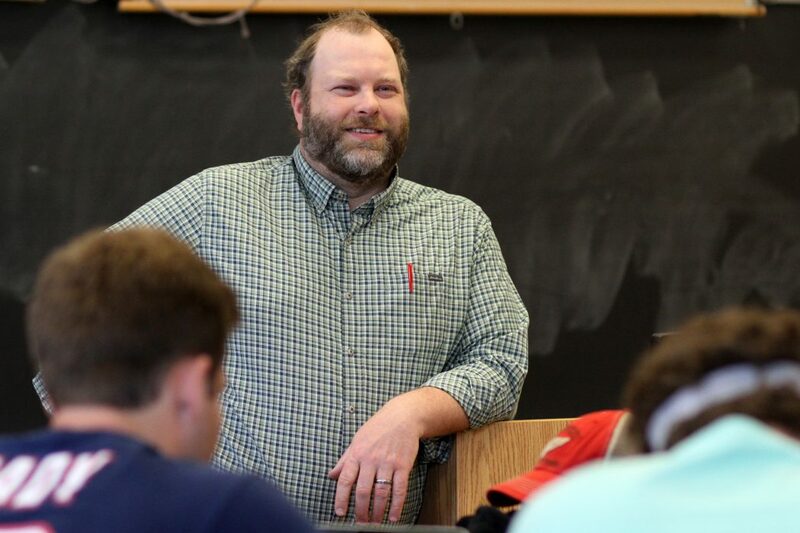 Professor Derek Nelson ’99 teaches in the classrooms where he learned from the likes of Professor Bill Placher ’70. Professor Nelson in Center 216. 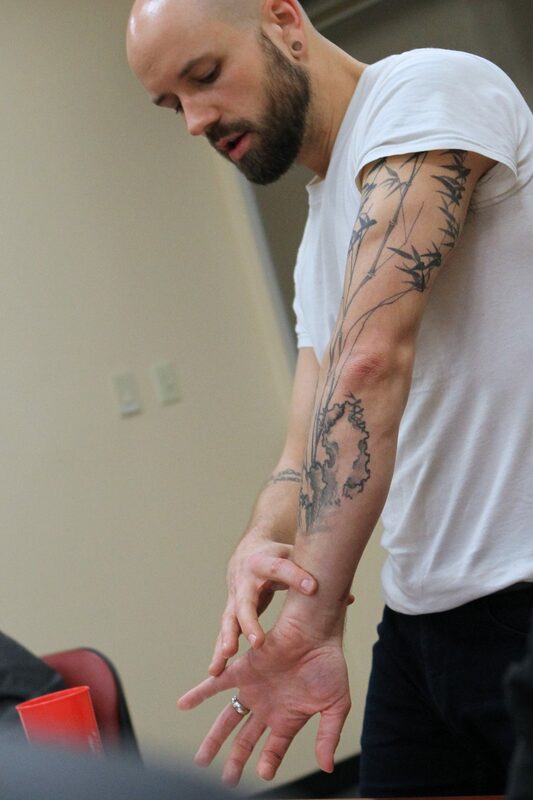 In the Essential Questions class, Professor Olofson employs his tattoo as a visual aid for teaching philosophy. 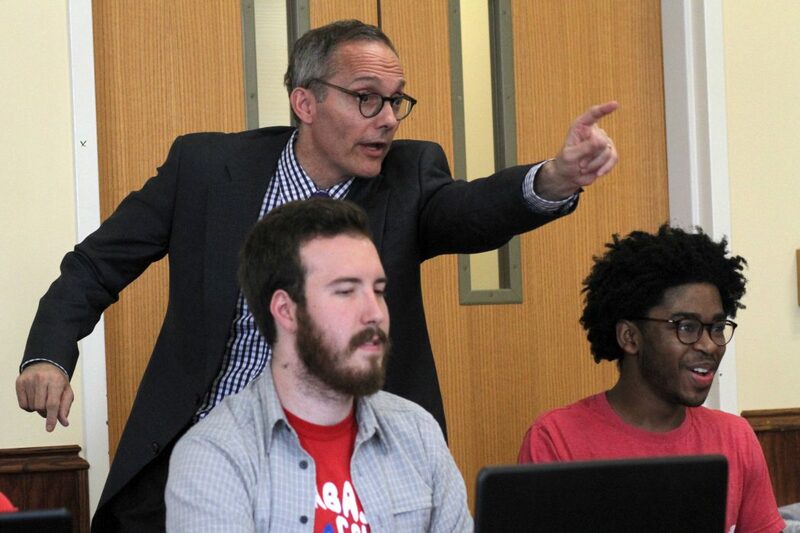 Professor Scott Himsel ’85 teaches his students to form arguments, to be advocates. 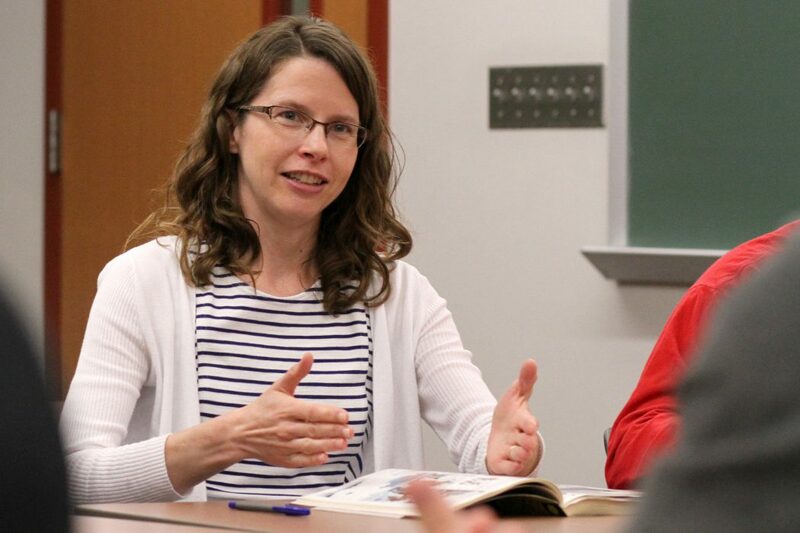 Professor Anne Bost talks about personal identity in her section of Essential Questions. 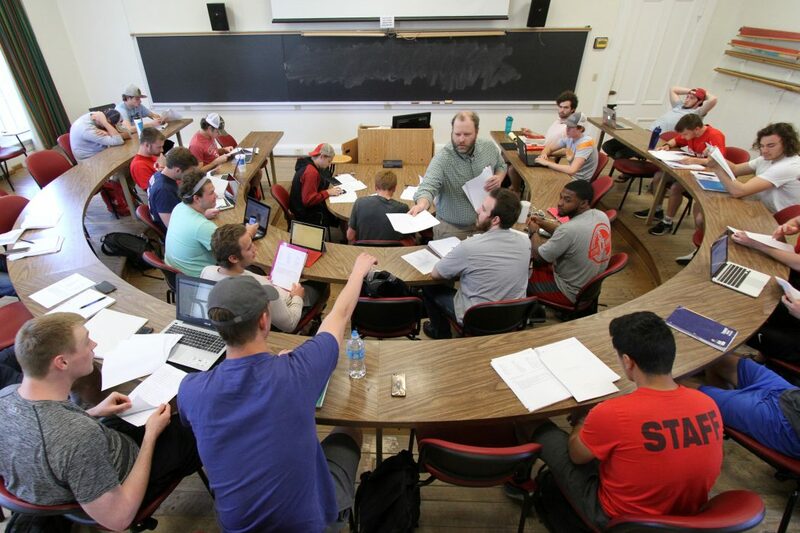 Ten minutes before the end his last class before retirement, math Professor Bob Foote was teaching a bunch of non-math majors about spherical geometry. Using two Hot Wheels cars on a globe he demonstrated—to the audible amazement of several students—that there are no parallel lines on a sphere. All lines eventually intersect, no matter how close together they may be. Senior Richie Abedin was having none of it. So Bob welcomed him to the front of the class, where Richie moved the toy cars around the globe to respectfully but passionately argue his point, to the delight of his teacher. 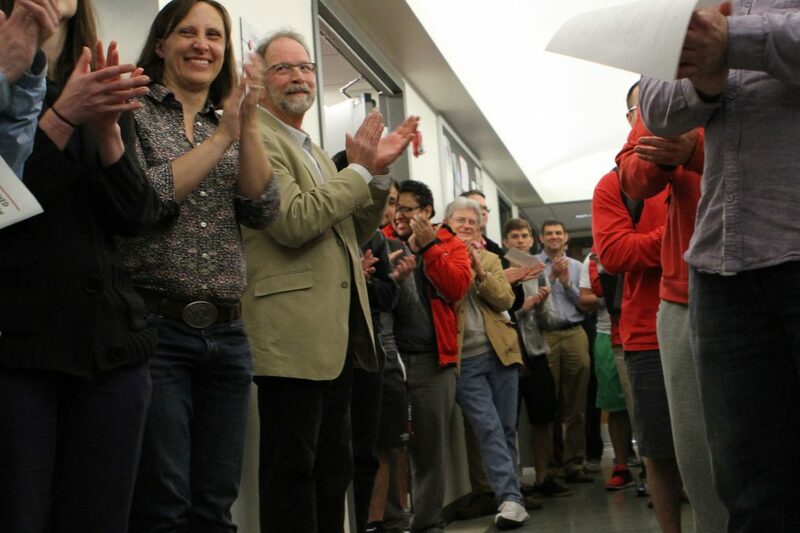 “I love the one-on-one part of teaching,” Foote would say a few minutes later when his fellow profs and students crowded into the hallway in Goodrich Hall for a surprise reception marking his nearly 30 years at Wabash. Richie’s challenge and attempt to demonstrate his point “may be one of my warmest memories of teaching” Bob told me the next day. The back-and-forth between student and teacher was the perfect exclamation point to Bob’s time in the classroom. 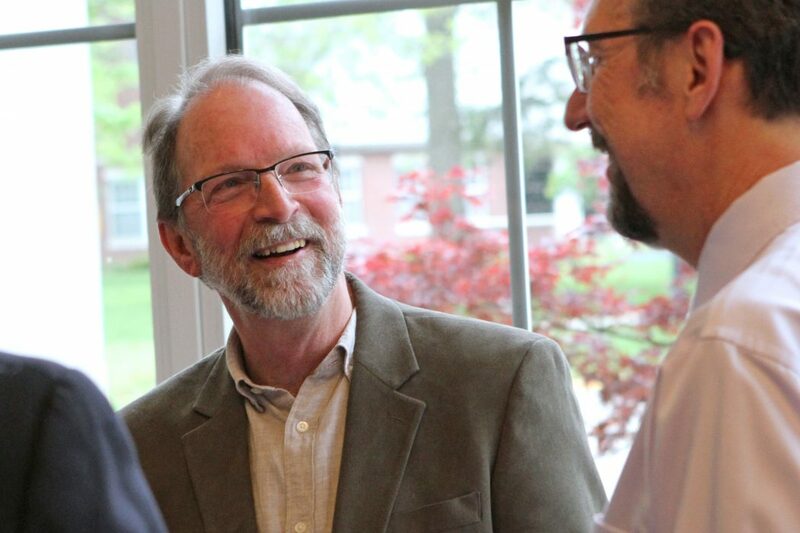 His was the last of three retirement receptions I photographed last week, each event revealing the gifts of the academic departments the professors were leaving. 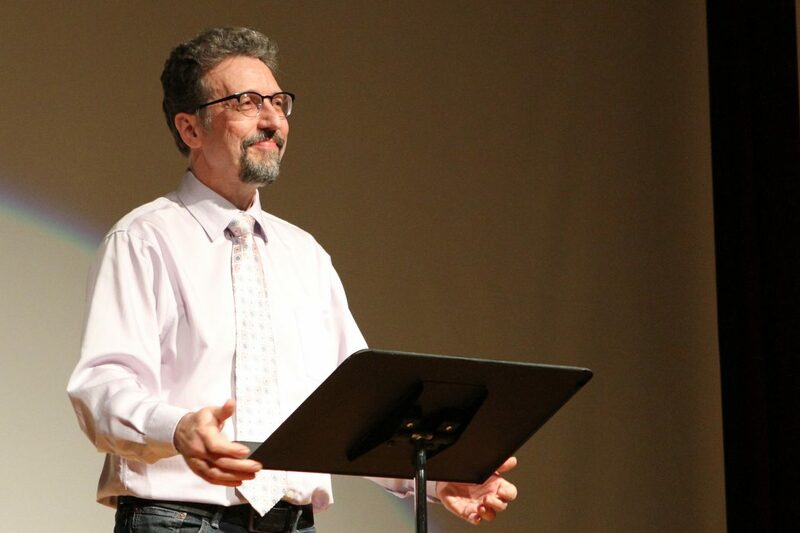 Theater students, alumni, and professors produced two films, recited lines from a play, and read from the work of Professor Dwight Watson to honor his time with them. 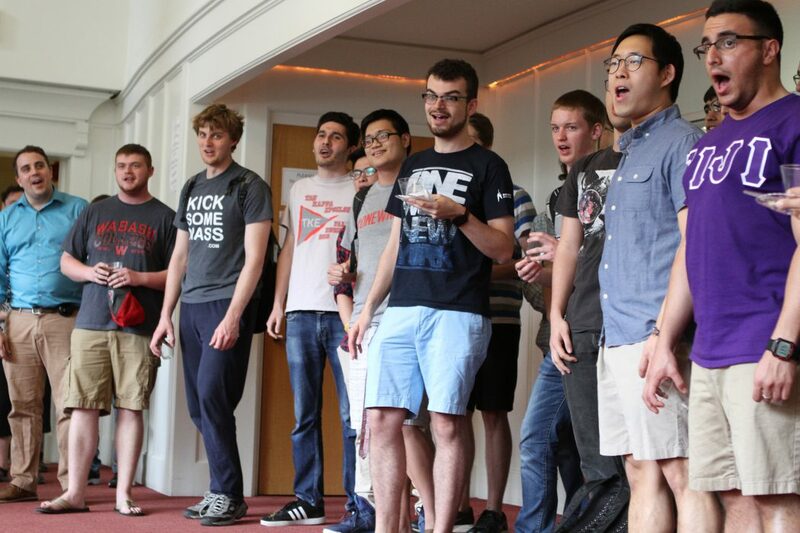 Members of the Glee Club sang in gratitude to departing director and music Professor Richard Bowen for his leadership and inspiration of that group on campus and around the world. 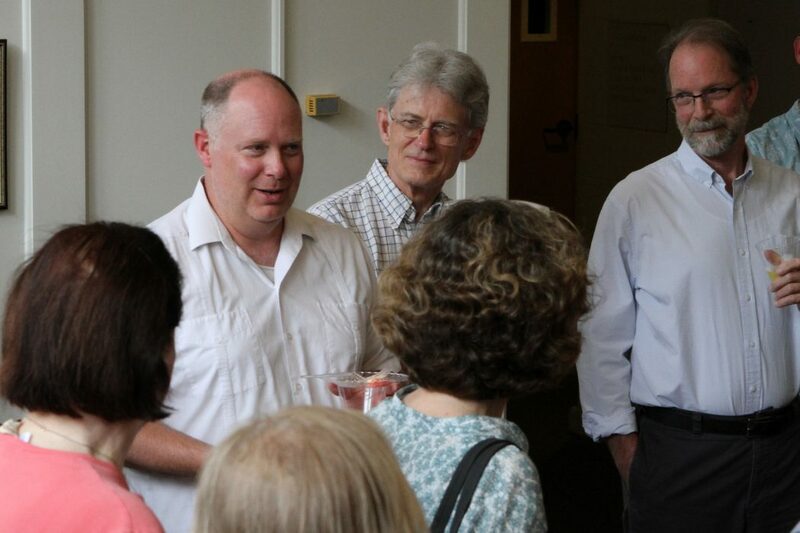 All three receptions were reminders of the deep connections formed here at Wabash between students and their teachers, and teachers and their department colleagues. 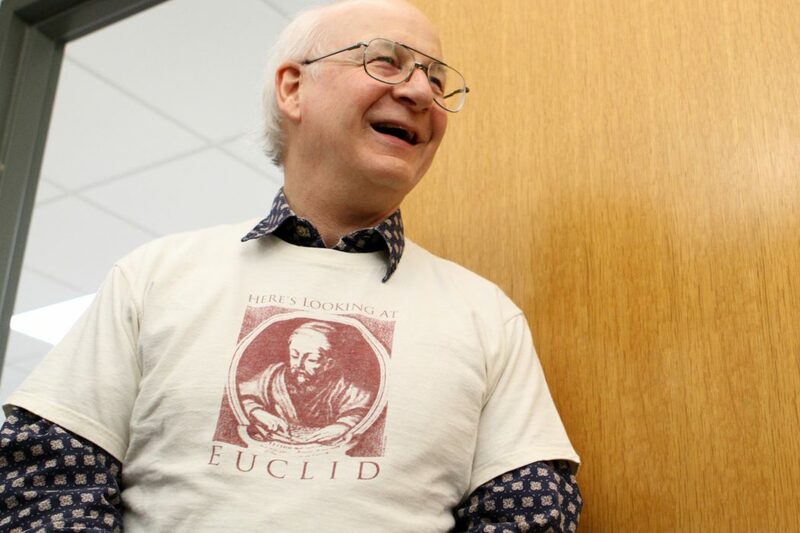 But I was caught off guard when religion Professor (and former Glee Club member) David Blix ’70 thanked Richard not only for his work with students and alumni, but also for his friendship. 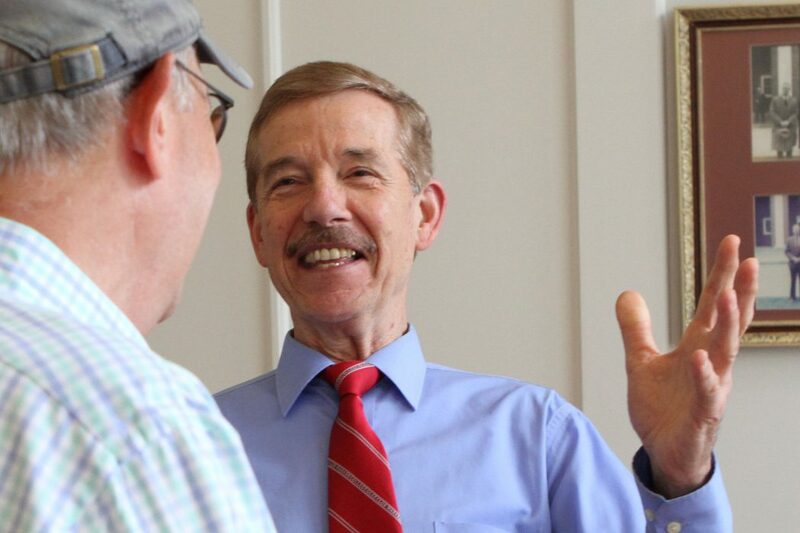 And the next day Professor of Theater Michael Abbott ’83, who was both a student and faculty colleague of Dwight’s, told those gathered to honor his mentor: “I’ve had a long time to think about what Dwight means to me, what I’ve learned from him. The kind of man I’ve always wanted to be. The next morning I thought of those words as I photographed psychology Professor Eric Olofson’s Essential Questions class. He was talking about a tattoo of bamboo on his arm, how the plant bends in the wind but does not break. He told his students the tattoo was a helpful reminder for him when he needs patience, calm, and wisdom, especially as a dad. 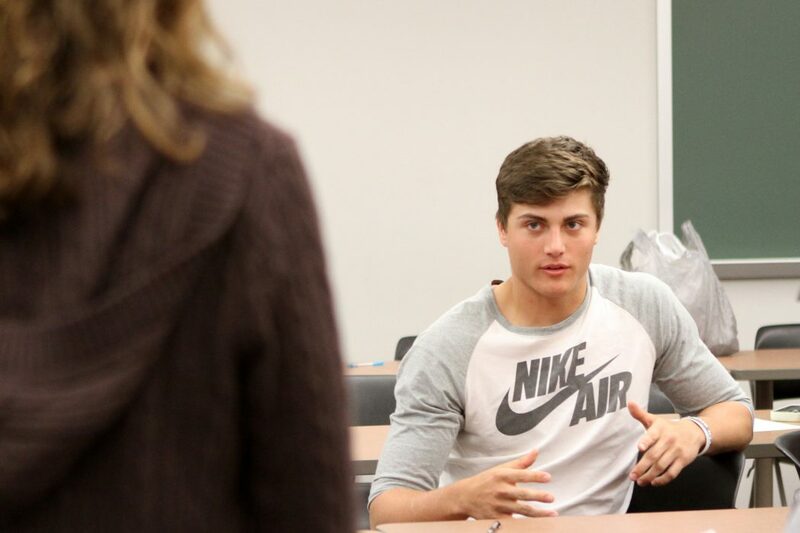 “Sometimes I’m not the man I want to be,” he admitted as he and the freshmen talked about the philosophy, the words, the ways one reaches for to become a better father, a better man. And so the true and essential work of this place goes on. 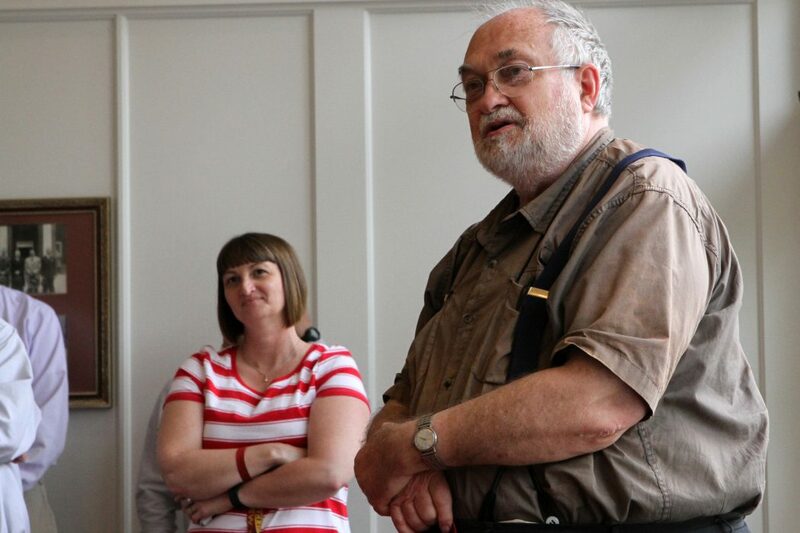 I spent the last teaching week of the semester photographing it in classes like Olofson’s, and Scott Himsel’s, and Derek Nelson’s, and Ann Bost’s, and celebrating it at receptions for Bob Foote, Richard Bowen, and Dwight Watson.